The best place to get started is at a local event, especially an introductory event near to you. At most events you can just turn up and have a go. You have to register and pay the fee and there will be someone at registration who will help guide you as what to do. When you get to the Start the adventure begins. After you have finished and downloaded your times you will be given a printout as a record of your endeavours. We hope you enjoy the experience and will want to join HAVOC, see the Membership page. You’ll need outdoor clothes and trainers or trail running shoes. There may well be rough ground and you can expect to sometimes get quite wet and muddy, depending on the area. Choose your clothes according to whether you expect to walk, jog or run. You should always wear full leg cover unless you know you will be orienteering on streets. If you have a compass and know how to use it, even at the most basic level, then take it. You could even attach an elastic or string loop to your compass to keep it comfortably on your wrist. Orienteering maps are drawn to a large scale, mostly 1:10000 (1cm on the map = 100m on the ground) or 1:5000 (1cm = 50m). The map shows a lot of detail, much more than on for example an Ordnance Survey map. Sometimes this can include individual boulders and trees. The colour of a symbol can often give you a clue about what it is. There may also be a key to the colours on the map. Black – this is usually used for rock features e.g. cliffs, crags and boulders but can also be used for man-made features. Brown – this is used to show land shape, including contour lines, gullies, pits and knolls (small hills). Blue – this is used for water features e.g. streams, lakes and ponds. Green – this is used to show density of woodland and undergrowth. The shade of green indicates how much the woodland or undergrowth is likely to impede your progress. Progressively darker shades of green mean increasing density and slower pace. Note however that open (runnable) woodland is White. Yellow – this is used for areas without trees. Solid, strong yellow is used for closely cropped grassy areas and grassy spaces such as playing fields. Paler yellow is used for rougher terrain such as tussocky grass and heather. There can be quite a big variation in the actual runnability on light yellow areas. (a) Be familiar with the map colours and symbols – see above. (b) Know how to align your map. Aligning your map means you turn your map so that it matches the landmarks as you pass them. The easiest way to start this is to line up the North lines on the map (the lines with the arrows at the top) with North as indicated on your compass. Stand facing North and hold your map in front of you so that you can see the features properly and match them up with the features on the map. You can then turn your map around each time you change direction. Think in terms of how you might turn a road atlas upside-down when you drive from Inverness to Edinburgh. The proper name for this technique is Setting or Orientating the map. Make sure you have everything you need for your course before setting off for the Start. You should have a map (only at a very low key event. 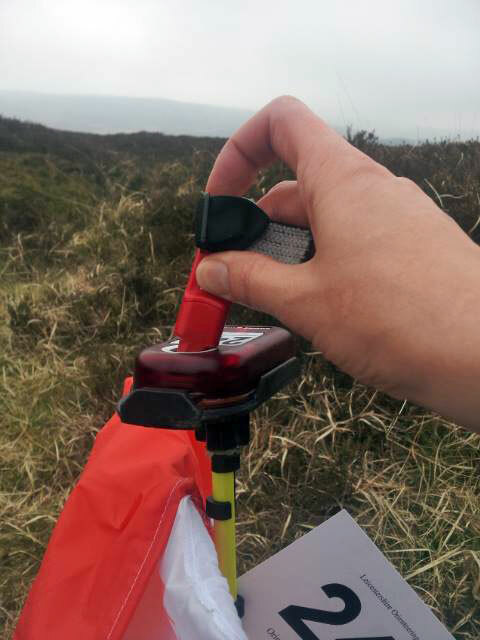 You are more likely to have to collect your map at the Start – check this though), loose control descriptions (again you may get these at the start), compass, electronic timing device (SI Card) for your finger, or a control card if you are to be punching manually, and you should be wearing appropriate clothing. You will have to clear your SI ‘Card’ by punching the electronic box marked ‘Clear’. Hold your SI Card in the box for a few seconds until it beeps and a red light flashes. You may also probably be asked to punch a box marked ‘Check’. If you try to punch the Check box and nothing happens you need to go back to the Clear box as you haven’t cleared properly. You may go through a series of up to 4 ‘boxes’ marked with tape on the ground. You move through at minute intervals before starting. When you reach the Start line and are told by the Starter that you can go, make sure you punch the electronic Start box to start your electronic timing. Pick up your map, if you don’t have it already and find the Start triangle on the map. You need to match this with what you see at the Start Kite on the ground. From the Start Triangle you then make your way to control 1 marked on your map. When you get there, check the control number matches number 1 on your control descriptions then punch it. Move on to control 2 and so on until you’ve visited each control on your course in order. Remember that if you are an experienced runner, but new to orienteering, you may be able to run much faster than you can keep in touch with the map! 8. What if you get ‘lost’ or make a mistake? You could go straight back to the last control you visited and take it again from there or you could look around and find a very obvious feature on the ground and then find the same feature on the map. You should then be able to continue on your way. You must punch each control in order shown on the map and on the control descriptions i.e. 1,2,3,4 etc (not the numbers which identify the control as being the correct one when you reach it). You will be disqualified if you visit the controls in the wrong order – electronic punching checks this. If you punch the wrong control or miss one out it’s still ok so long as you go back to the last correct control and take it from there again. Remember you haven’t actually finished your course until you punch the Finish. This means you must keep running after you’ve punched the last control as your timing doesn’t finish until you actually reach the Finish and punch it. You can then relax! After you’ve punched the Finish, head for the ‘Download’. Here you will be asked to put your SI Card into the Download box. This produces a printout of your time and includes your split times so you can see how long it took you to run between controls. You’ve now finished and before long you’ll be able to check the Results to see how your results compare with others on your course. In due course the full results will be uploaded on to the organising Club’s website. There is a useful Newcomers Guide on the British Orienteering website. 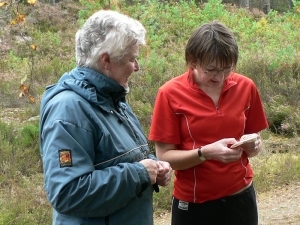 British Orienteering is the sport's governing body and is sometimes known as BOF (British Orienteering Federation) and consists of 12 regional orienteering associations. If you want practical help with navigation or other aspects of orienteering, contact the HAVOC Club Coach: .